Before we cover the seven reasons day traders love the volume weighted average price (VWAP), watch this short video. This video is a great primer before we dig into advanced techniques and strategies. Finding the average price based on the closing value will not provide an accurate picture of a stock’s health. This is where the VWAP comes into play. 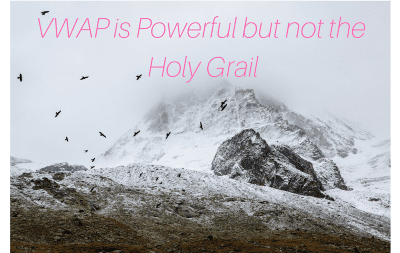 If you are wondering what the VWAP is, then wait no more. The VWAP identifies the true average price of a stock by factoring the volume of transactions at a specific price point and not based on the closing price. Did the stock close at a high with low volume? Did the stock move to a new low with light volume? These are all critical questions you would want to be answered as a day trader before pulling the trigger. This is where the VWAP can add more value than your standard 10, 50, or 200 moving average indicators because the VWAP reacts to price movements based on the volume during a given period. In this article, we will explore the seven reasons day traders love using the VWAP indicator. 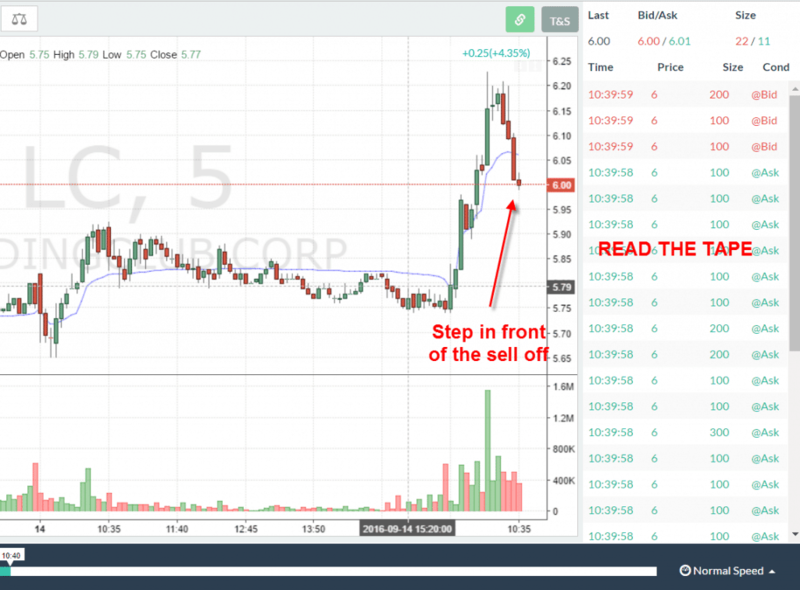 While we have highlighted day traders, what we will discuss in this article is also applicable for swing traders and those of you that love daily charts. So, if you do not partake in the world of day trading, no worries, you will still find valuable nuggets of information in this post. Now that your expectations are set, before we dig into why traders love the VWAP, let’s first walk through a few key concepts when using the indicator. Most importantly, I want to make sure we have an understanding of where to place entries, stops, and targets. After studying the VWAP on thousands of charts, I have identified two basic setups: pullbacks and breakouts. By far, the VWAP pullback is the most popular setup for day traders hoping to get the best price. Remember, day traders have only minutes to a few hours for a trade to work out. The VWAP breakout setup is not what you may be thinking. I am not looking for a breakout to new highs but a break above the VWAP itself with strength. Now, let’s dig into the entry points for these setups. The first option is for the more aggressive traders and would consist of watching the price action as it is approaching the VWAP. Wait for a break of the VWAP and then look at the tape action on the time and sales. You will need to identify when the selling pressure is spiking, and the tape is going crazy. This, my friend, is more art than science and will require you to practice reading the tape. The goal is to identify when the selling pressure is likely to subside and then enter the trade. This approach will break most entry rules found on the web of simply buying on the test of the VWAP. The problem with this approach is you don’t know if the price will breach the VWAP by 1% or 4%. I learned the hard way, and if the VWAP were at $10, I would place my limit order at $10. At times there were traders who couldn't care less about the VWAP, and it would slice through the indicator with such swiftness, the lasting sting to my psyche persists until this day. This technique of using the tape is not easy to illustrate looking at the end of day chart. You will need to practice this approach using Tradingsim to assess how close you can come to calling the turning point based on order flow. This is what I would recommend to traders that are new to the VWAP indicator. Essentially, you wait for the stock to test the VWAP to the downside. Next, you will want to look for the stock to close above the VWAP. You will then place your buy order above the high of the candle that closed above the VWAP. While this is a more conservative approach for trade entry, it will open you up to more risk as you will likely be a few percentage points off the low. You will need to determine where you are in your trading journey and your appetite for risk to assess which entry option works best for you. It goes without saying that while we have covered long trades; these trading rules apply for short trades, just do the inverse. Now that you are in the trade, where should you place your stop? 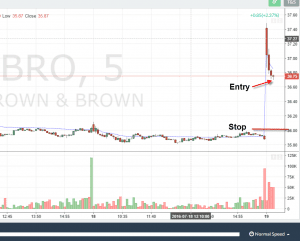 If you take the aggressive approach for trade entry, you will want to place your stop at your daily max loss or a key level (i.e., morning gap). Again, this can work, but be prepared for wild swings that can occur if you get things wrong. The pullback stop is simple to identify; it is the most recent low point. Therefore, after you enter the trade, if the stock begins to rollover, breaks the VWAP and then cuts through the most recent low – odds are you have a problem. At this point, you will want to close the trade and protect your capital. The target for the VWAP trade is my favorite part of this article, as I like to make money trading. 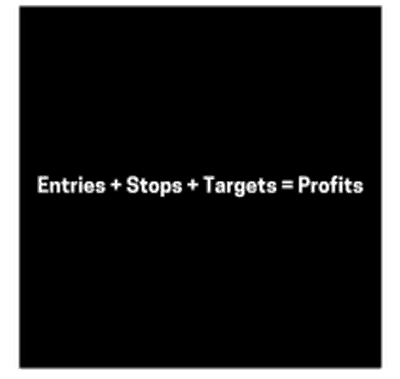 You have a few ways to determine your profit potential on each trade. This is the most popular approach for exiting a winning trade for seasoned day trading professionals. After entering the trade, you place your stop below the most recent low and then look to the high of the day to close the position. You will notice that after the morning breakouts that occur within the first 20-40 minutes of the market opening, the next round of breakouts often fails. This is because the seasoned traders are selling their long positions to the novice day traders who buy the breakout of the high as we go beyond the first hour of trading. This gives the seasoned traders the opportunity to unload their shares to the unsuspecting public. In case you are wondering, yes, this is legal. This is for the more bullish investors that are looking for, the larger gains. This approach is based on the hypothesis that the stock will break the high of the day and run to the next Fibonacci level. 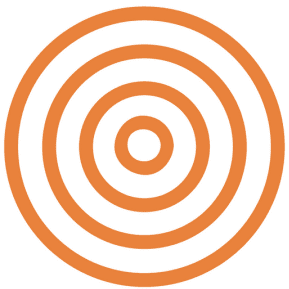 This target can represent huge gains, often in the 4% to 10% realm for day trades. This, of course, means the odds of hitting this larger target is less likely, so you will need to have the right frame of mind to handle the low winning percentage that comes with this approach. There, of course, other exit strategies, but these are my favorites. Whichever methodology you use, just remember to keep it simple. The market is the one place that really smart people often struggle. If you have been trading for some time, you know the indicators and charts are just smoke and mirrors. Your success will come down to your frame of mind and a winning attitude. So, let’s take a break from the quantitative and get more into the fuzzy area of the state of mind. The VWAP trade is something that I have tested quite a bit and have achieved mixed results to date. A pullback trade just makes sense when you look at it on paper. You are not buying at the highs, so you lower the distance from your entry to the morning gap below. Thus reducing the money, you are risking on the trade if you were to just buy the breakout blindly. Also, you can monitor and “size up” the trading activity as the stock shifts back and forth trying to find its footing at the VWAP. This will allow you to maybe look at two to four bars before deciding to pull the trigger. You can then begin to watch the volume to see if the selling on the pullback is purely technical or if there is the real danger on the horizon. Sounds clean and neat uh? Well, let's discuss what you will likely be thinking if a VWAP pullback does not go in your favor. The next thing you will be faced with is when to exit the position. If the stock shot straight up, it will be tough to find a pivot point without opening yourself up to a significant loss. 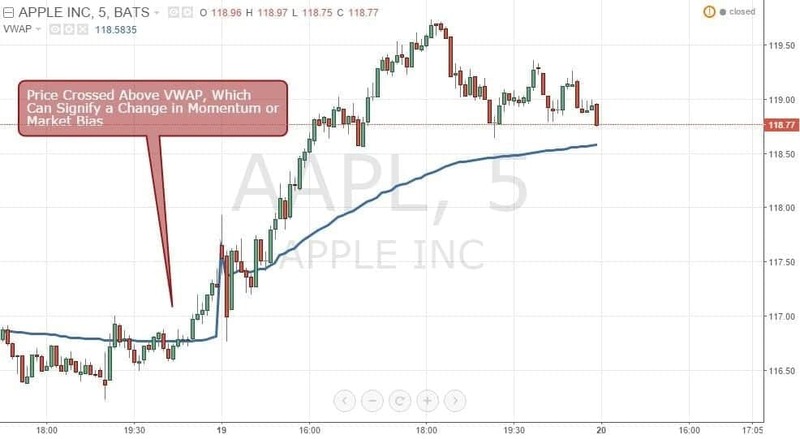 If the stock does have a close pivot point, you now are faced with the option of seeing if the price closes below the VWAP, or if it can reverse and hold its ground. These are the type of answers you need to have completely flushed out in your trading plan before you think of entering the trade. The VWAP and quite frankly, no other indicator will address these internal questions/conflicts you will be facing. 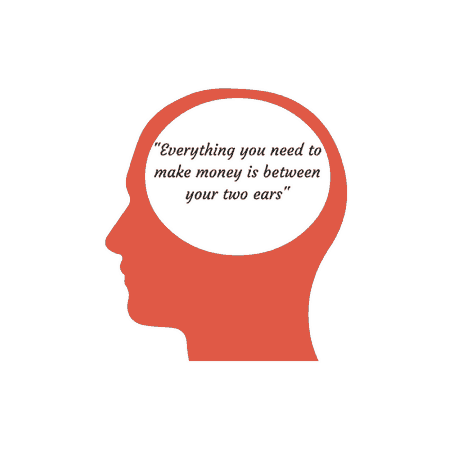 These are things that you need to manage and keep under control if you want to have any success in the markets. I do not want to paint this doom and gloom picture for you, so let’s shift to more of a positive tone. Now, the flip side to this trade is when you get it just right. I mean the stock pulls back to the VWAP, you nail the entry and the stock just runs back to the previous high and then breaks that high. Talk about a feeling of mastery; it’s just lights out trading. The stock will instantly go in your favor and depending on the volatility of the stock; you will find yourself up 2% to 3% without even blinking. The money will literally fall into your account. I have laid out these two scenarios so that you get a feel for what it means to be in a losing and winning VWAP trade. Simply knowing when you are in a winner or a loser and how quickly it takes you to come to that conclusion will be the deciding factor between an up-sloping equity curve and one that runs into the ground. Now that you have a handle on the basics and psychology behind the setup, let’s dig into a number of real-life trading examples. 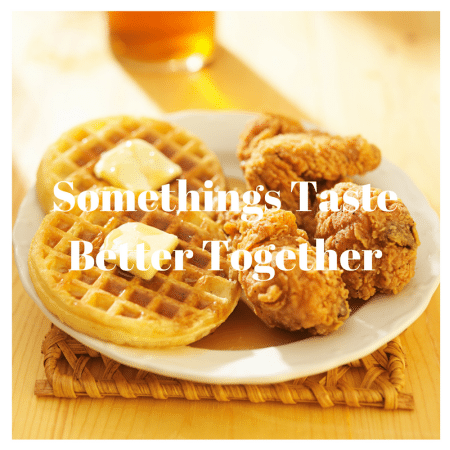 Let’s review a real-life example to see what to do when things don't go as planned. In this trade example, we will review the Financial Sector ETF (XLF). Why the XLF you might ask? 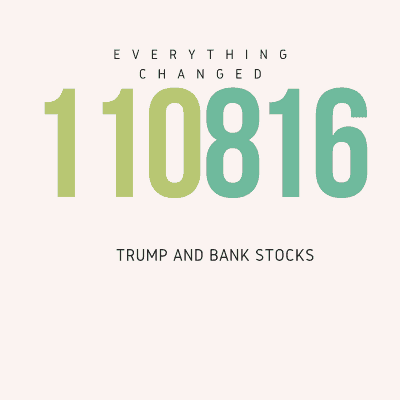 Well since the election of Donald Trump, banking stocks have been outperforming the broad market hand over fist, so I thought it would be great to highlight something that’s currently taking place in the market. 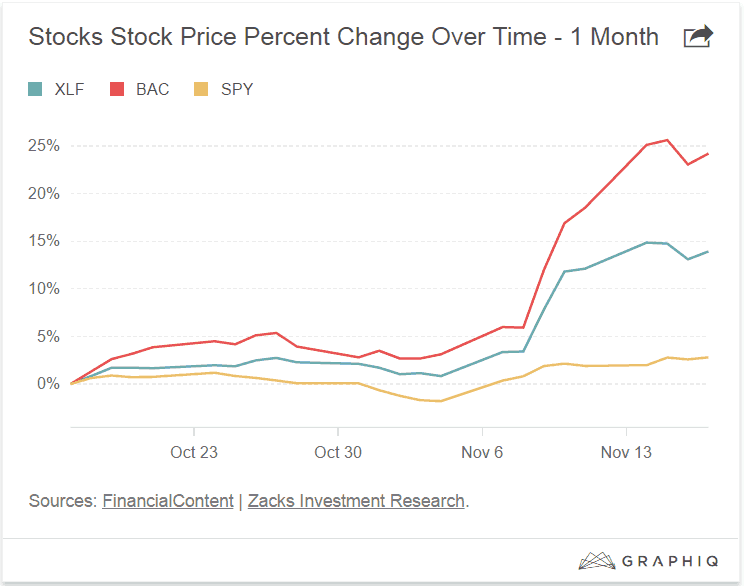 If you were long the banking sector, when you woke up on November 9th, 2017 you would have been pretty happy with the price action. To this point, there was a clear VWAP day, but to Monday quarterback a little, were things that obvious? Notice how the ETF had a huge red candle on the open as it gave back the gains from the morning. I would also like to highlight the gains were only there for a few seconds because this is not apparent looking at a static chart. As a trader, how would you know if XLF was going to crash back through the VWAP on the third candle or if it would go higher? Remember, the election of Trump was not expected, so it was really anyone’s call what would happen on the open. Then XLF experiences a slight rally, only to rollover again and retest the VWAP. Should you have bought XLF on this second test? Notice how the XLF doesn’t hold the VWAP and actually trades below the indicator. Now that I have completely confused you, these are just a few of the things I want to highlight because these are likely the thoughts that will be running through your mind in real-time. Another key point to highlight is that stocks do not honor the VWAP as if it is some impenetrable wall. If you read other posts on the web about the VWAP, it gives you the impression that if a stock closes below the VWAP you have to run for the hills. This is the furthest thing from the truth. There are automated systems that push prices below these obvious levels (i.e. 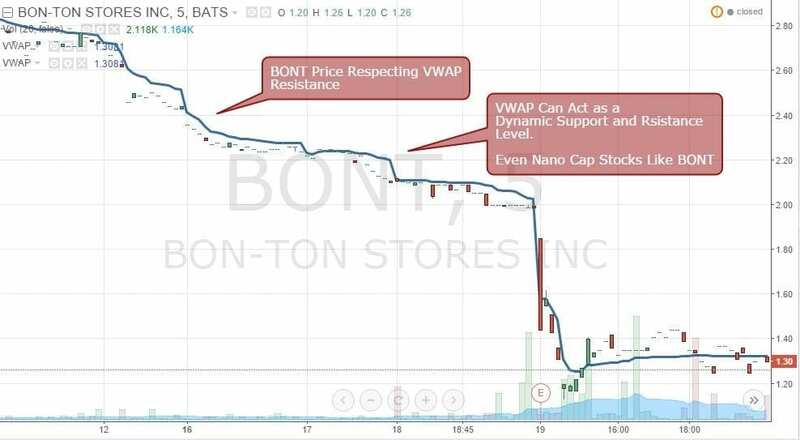 VWAP) to trip the ton of retail stops, in order to pick up shares below market value. In addition, you may use the VWAP, but many traders do not have the indicator on their chart. Therefore, what is so apparent to you is not even on another trader’s radar. Now, back to the trade. The last thing that made this trade difficult is the volume action on the break above the VWAP didn’t scream buy me. However, if you look a little deeper into the technicals, you can see XLF made higher lows and the volume, albeit lighter than the morning, is still trending higher. 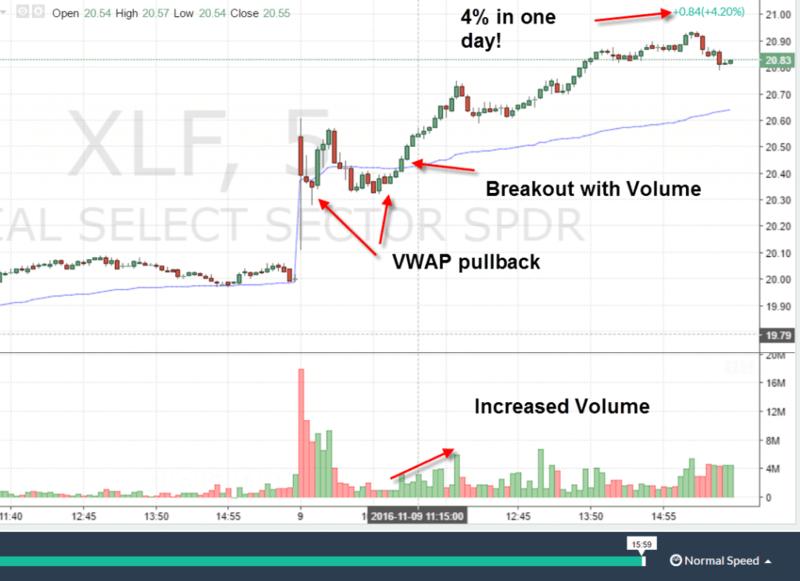 Once XLF was able to get back above the VWAP with steadily increasing volume, it never looked back. Again, not the perfect setup technically, but if you can read in-between the lines, you could see the potential of the trade. Remember as a trader, we are not here to guess how the news will affect prices; we just trade whatever is in front of us. 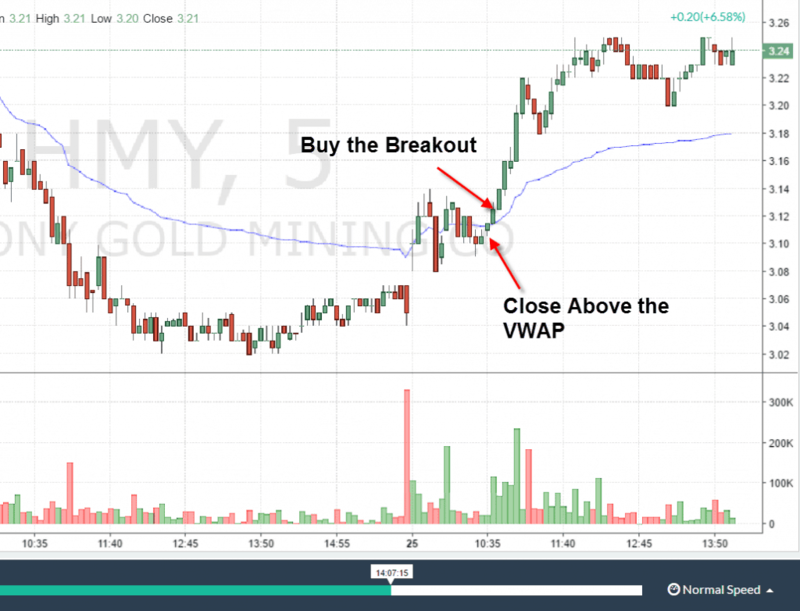 Let’s dig a little deeper into VWAP breakout trades and the volume associated with these moves. Volume to is the lens you can apply to the market, which can make sense of all the chaos. This is a trade of Buckeye Partners, LLP where you can see the stock stayed below the VWAP for some period of time. Then BPL was able to climb above the VWAP, but started to just hang around. At this point, you could jump into the trade, since the stock has been able to reclaim the VWAP, but from what I have observed in the market, things can stay sideways for a considerable amount of time. Remember, it’s not just about placing trades; you need to place trades that will make the best use of your time and money. The key thing you want to see is a price increase with significant volume. Will you get the lowest price for a long entry- absolutely not. However, you will receive confirmation that the stock is likely to run in your desired direction. 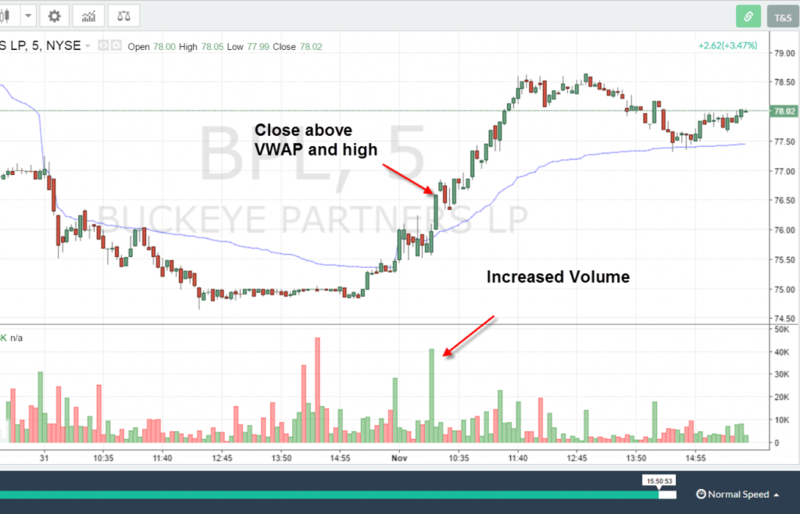 In this specific trading example, you will want to wait for the price to move above the high volume bar coming off the VWAP. This is a sign to you that the odds are in your favor for a sustainable move higher. As a day trader, remember that move higher could take 6 minutes or 2 hours. You will have to judge the speed at which the stock clears certain levels in order to determine when to exit your long position. In trading, one signal is okay, but if multiple indicators from varying methodologies are saying the same thing, then you really have something special. If you are unfamiliar with the concept of confluence, essentially you are looking for opportunities where another technical support factor is at the same price of the VWAP. For example, a Fibonacci level or a major trend line coming into play at the same level of the VWAP indicator. This confluence can give you more confidence to pull the trigger, as you will have more than just the VWAP giving you a signal to enter the trade. This brings me to another key point regarding the VWAP indicator. There are great traders that use the VWAP exclusively. 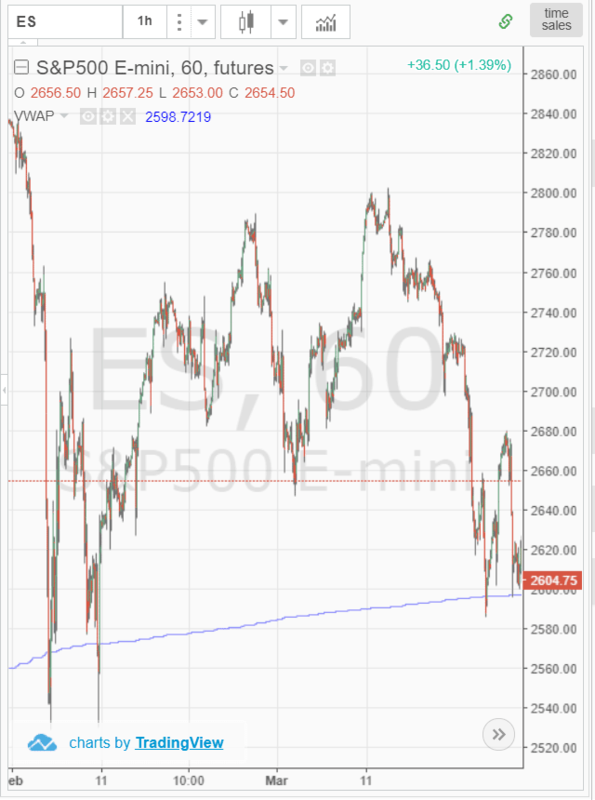 However, these traders have been using the VWAP indicator for an extended period of time. When starting out with the VWAP, you will not want to use the indicator blindly. I’m not suggesting you throw 10 indicators on your chart for confirmation, but you will need to use some other validation tool to ensure you are seeing the market clearly. Timing is everything in the market and VWAP traders are no different. While stocks are always trading above, below, or at the VWAP, you really want to enter trades when stocks are making a pivotal decision off the level. To do this, you need to have the ability to scan for these setups in real-time. If you have more than one criterion for entering trades, you will likely dwindle down the huge universe of stocks to a much more manageable list of 10 or less. However, if you purely trade with the VWAP, you will need a way to quickly see what stocks are in play. To do this, you will need a real-time scanner that can display the VWAP value next to the last price. You can then do a crosswalk of the VWAP with the current price to identify volatile stocks that are testing the indicator. You are probably asking what are those numbers under the symbol column. 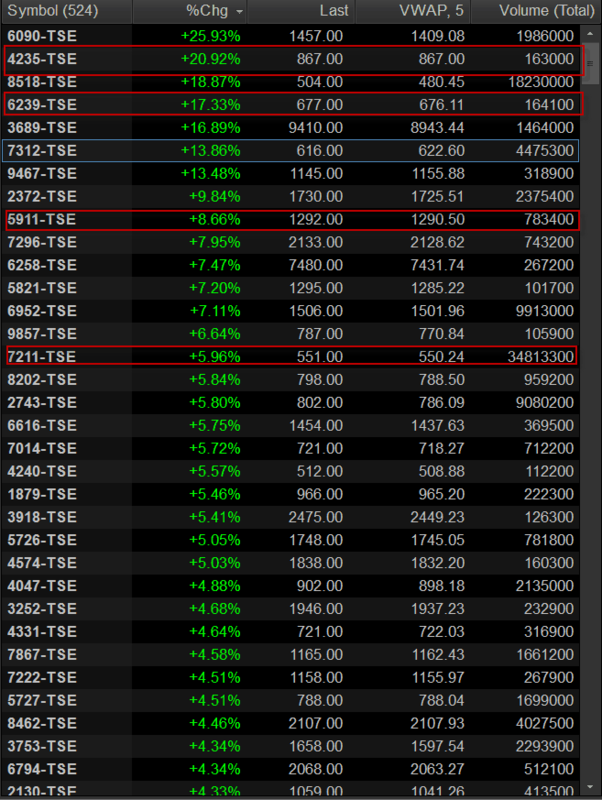 For those of you that don’t know, I trade the Nikkei at night from the States. While I did not highlight every symbol nearing the VWAP, you get the point. Another option if you have the ability to develop a custom scan is to take the difference of the VWAP and the current price and display an alert when that value is zero. Essentially, this is the numerical representation that the price and VWAP are overlapping. I’m hoping that the information thus far has increased your level of understanding when it comes to the VWAP indicator. 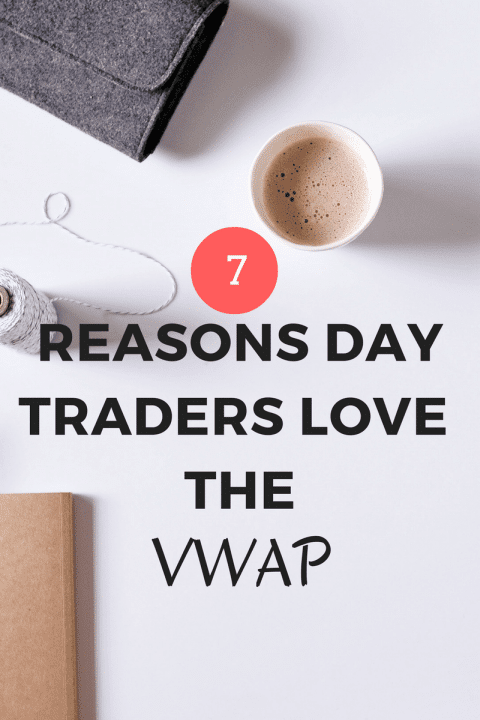 Now, we can shift into what first caught your attention – the 7 reasons day traders love the VWAP! As you can see, by multiplying the number of shares by the price, then dividing it by the total number of shares, you can easily find out the volume weighted average price of the stock. Since the VWAP takes volume into consideration, you can rely on this more than the simple arithmetic mean of the transaction prices in a period. To learn more about the VWAP formula, check out this article from Wikipedia. Theoretically, a single person can purchase 200,000 shares in one transaction at a single price point, but during that same time period, another 200 people can make 200 different transactions at different prices that do not add up to 100,000 shares. In that situation, if you calculate the average price, it could mislead as it would disregard volume. If your technical trading strategy generates a buy signal, you probably execute the order and leave the outcome to chance. However, professional day traders do not place an order as soon as their system generates a trade signal. Instead, they wait patiently for a more favorable price before pulling the trigger. If you find the stock price is trading below the VWAP indicator and you buy the stock at market price, you are not paying more than the average price of the stock for that given period. With VWAP trading, you can stick to a trading strategy where you can always buy low. By knowing the volume weighted average price of the shares, you can easily make an informed decision about whether you are paying more or less for the stock compared to other day traders. Buying low and selling high is all-great; however, if you are a momentum trader, you would look to buy when the price is going up and sell when the price is going down, right? A VWAP strategy called the VWAP cross can help you locate and trade momentum in the market. Since the VWAP indicator resembles an equilibrium price in the market, when the price crosses above the VWAP line, you can interpret this as a signal that the momentum is going up and traders are willing to pay more money to acquire shares. When the price crosses below the VWAP, consider this a signal that the momentum is bearish and act accordingly. 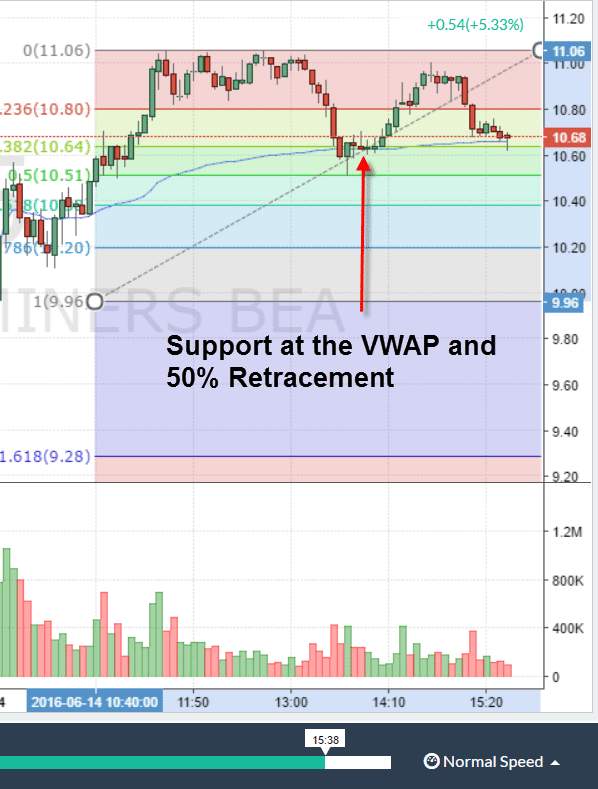 Day traders love the VWAP indicator because more than often, the price finds support and resistance around the VWAP. 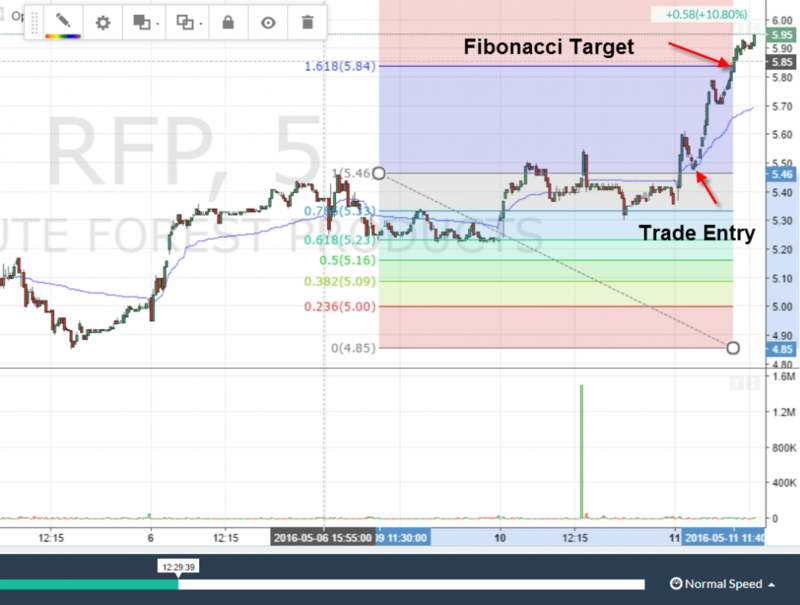 Although this is a self-fulfilling prophecy that other traders and algorithms are buying and selling around the VWAP line, if you combine the VWAP with simple price action, a VWAP strategy can help you find dynamic support and resistance levels in the market. You should note the likelihood of a VWAP line becoming a dynamic support and resistance zone becomes higher when the market is trending. Ever wondered if a stock is overbought or oversold and if it's time to take a counter trend trade? 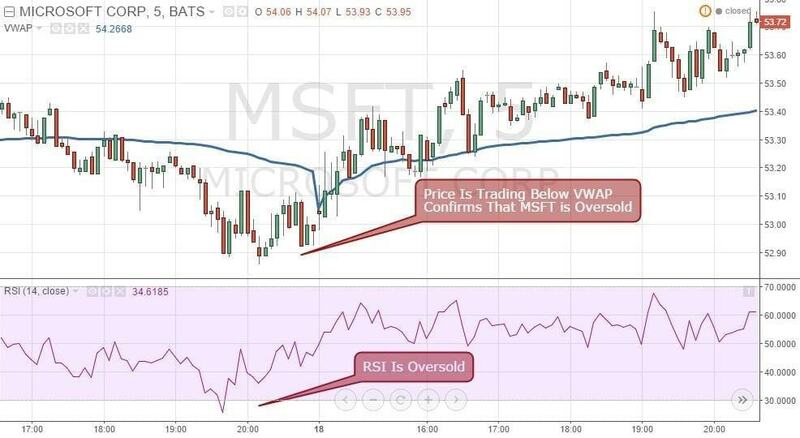 If you are just looking at the RSI or Stochastics and double guessing if this is a strong trend or the market will turn back, then adding the VWAP indicator on your chart can make your life much easier. Professional day traders have a rule of thumb when using the VWAP - if the VWAP line is flatlining, but the price has gone up or down impulsively, the price will likely return to the VWAP line. However, if the VWAP line is starting to gradually go up or down along with the trend, it is probably not a good idea or good time to take a counter-trend position. Most day traders do not understand that their actions can affect the market itself because we often trade our personal funds at the retail level. However, if you are a hedge fund manager or in charge of a large pension fund, your decision to buy a stock can drive up the price. Just imagine for a second you are day trading and want to buy 5,000 shares of Apple (AAPL). AAPL is a fairly popular stock and traders rarely face any liquidity problems when trading. Hence, you will quickly find a seller willing to sell his 5,000 AAPL shares at your bid price. However, if you want to buy 1 million AAPL shares within 5 minutes and place a market order, you will probably buy up all the AAPL stock on sale in the market at your given bid price within a second. Once that happens, your broker will fill the rest of your order at any price imaginable, but probably higher than the current market price. Congratulations, you have just bid the price up and impacted the market! Placing a large market order could be counterproductive, as you will end up paying a higher price than you originally intended. Hence, when you want to buy large quantities of a stock, you should spread your orders throughout the day and use limit orders. If you find the stock price is trading below the VWAP, you are paying a lower price compared to the average price, right? This way, a VWAP strategy can act as a guide and help you reduce market impact when you are dividing up large orders. You may think this example only applies to big traders. But wait until you want to buy 10k shares of a low float stock. You will soon find out that the stock may only trade 500 shares or fewer every 5 minutes. Good luck trying not to bid up the price if you want to scoop up those 10k shares right away. They are watching you - when we say they; we mean the high-frequency trading algorithms. Have you ever wondered why the liquidity levels in the stock market have gone up over the last few years? The high-frequency algorithms can act as little angels when liquidity is low, but these angels can turn into devils as the attempt to bid up the price of a stock by placing fake orders only to cancel them right away. If you are emotionally following the tape, you may start executing market orders because you are worried the price will run away from you. This is where the VWAP can come into play. Instead of focusing on the level 2, you can place limit orders at the VWAP level to slowly accumulate your shares without chasing these phantom orders. From my personal experience with the VWAP, I would scan for high volatile stocks and then apply the VWAP to the chart. 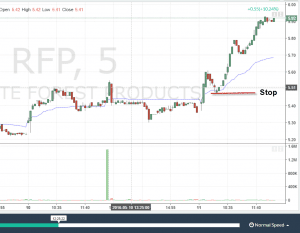 This approach put me in the best position to turn a big profit, but one thing I noticed is highly volatile stocks have little respect for any indicators - including the VWAP. Two of the chart examples just mentioned are of Microsoft and Apple. These are two widely popular but not very volatile stocks. At first glance, you are likely thinking what's the big deal Al? 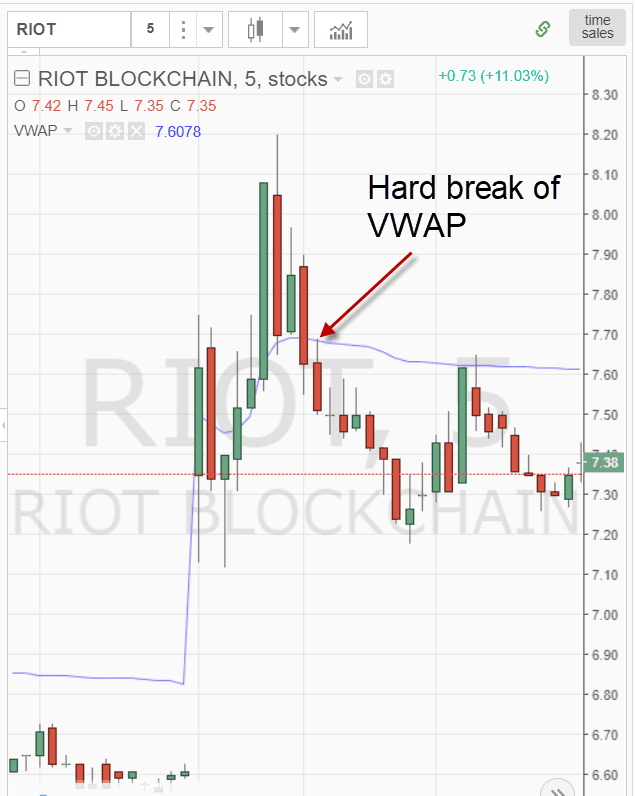 RIOT blockchain did exactly what we expect stocks do when interacting with the VWAP. 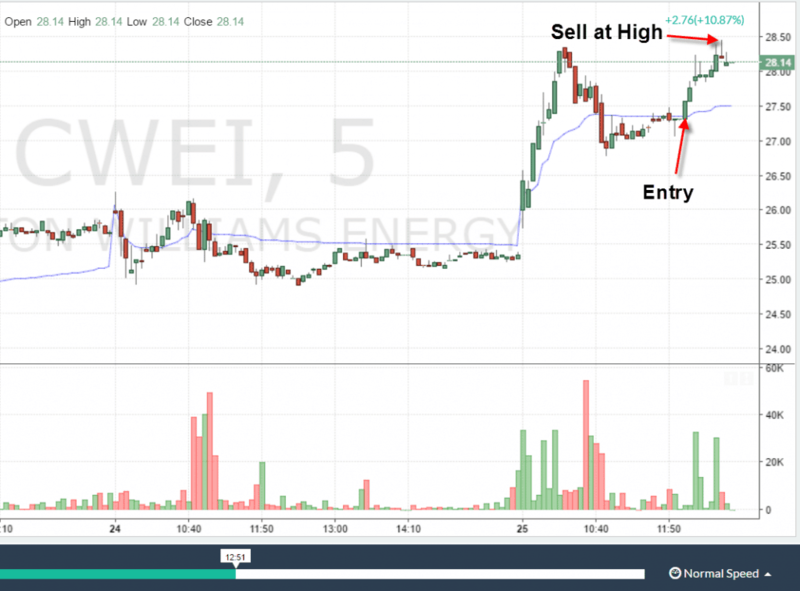 In the morning the stock broke out to new highs and then pulled back to the VWAP. This pullback to the VWAP would have been a likely opportunity to get long the stock for a rebound trade. This lack of a bounce produced a violent selloff from $7.70 to $7.20. This represented a sell-off of almost 7% in 40 minutes. Do you think you would have what it takes to sit through a 7% beat down? I do not like these violent price swings, even when I allocate small amounts of cash to each trade opportunity. 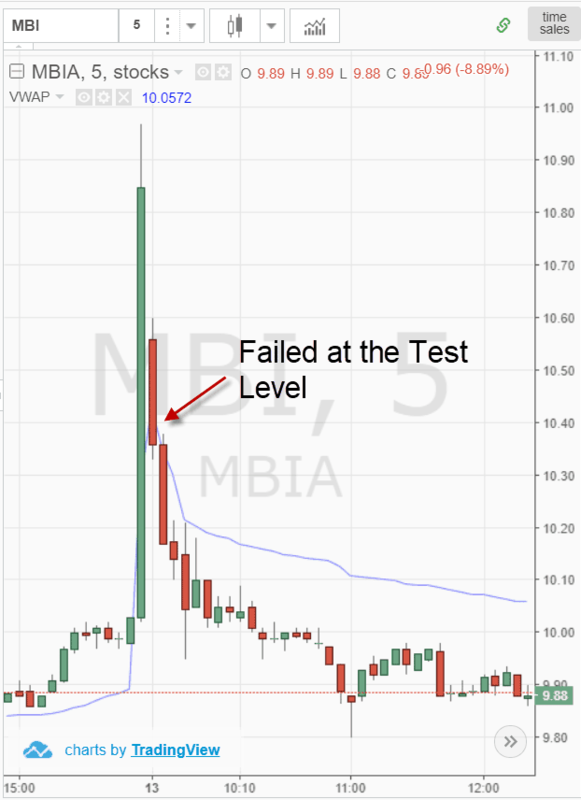 In the next example, MBI had an explosive move up through the VWAP indicator. The stock then came right back down to earth in a matter of 4 candlesticks. When I say 4 candlesticks, I mean literally a 10% down move in 20 minutes. You can see MBI did not recover to the VWAP level even as time pushed beyond 12 noon. Again, are you mentally prepared for this level of volatility in your trading? 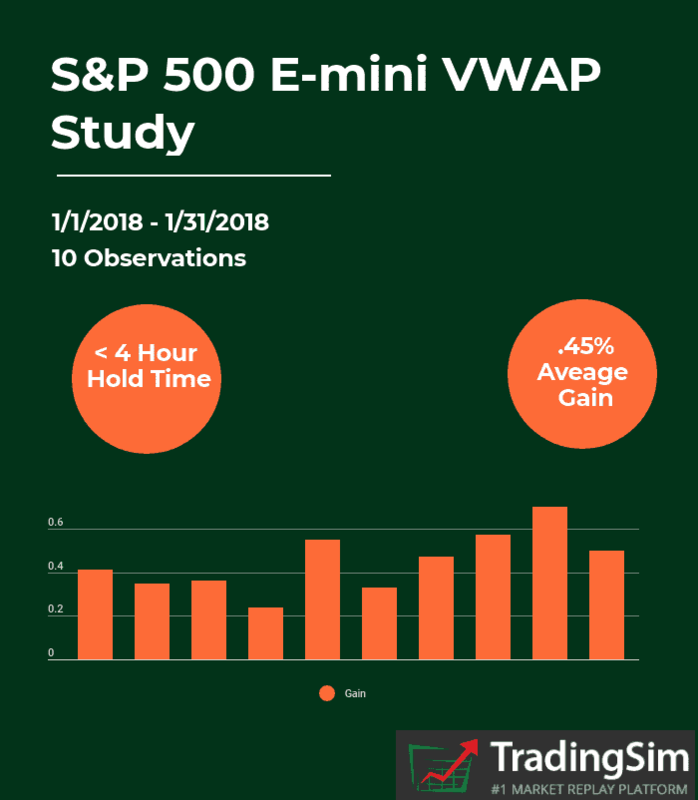 Building upon the concept of securities with more predictable volatility, I wanted to explore how the VWAP performs with the S&P E-mini futures contract. For those of you that trade the S&P E-mini, you know all too well the contract moves in a familiar pattern. The dramatic selloff in February felt extreme after the low volatility the S&P had experienced over the prior 5 months. 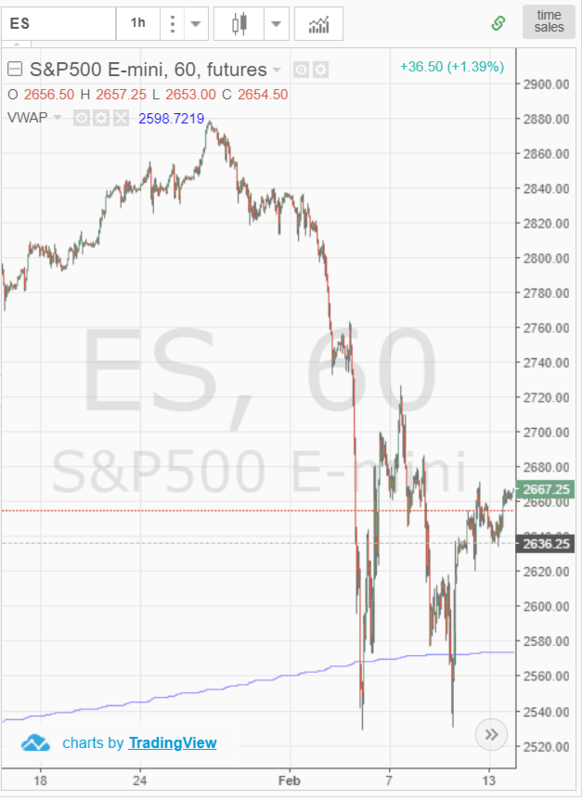 Then the selloff began and for VWAP traders, it was clear the 2,570 level would provide significant volume and price support for the S&P 500 E-mini contract. As you can see, the VWAP does not perform magic. However, the VWAP clearly did an awesome job of identifying where the bulls were likely to regain control. The S&P rallied more than 10% from the lows. What do you think happened when the S&P 500 E-mini took another breather? That's right, the futures contract ran right back down to the VWAP for support. The VWAP provided support over the last few tests; however, more tests can weaken the resolve of the bulls. Time will tell if support will hold. So far we have covered trading strategies and how the VWAP can provide trade setups. Now, let's discuss a case study to highlight how price interacts with the VWAP to help formulate a trading strategy. Many traders will have their own hypothesis in place and force that hypotheses on the market. Our approach is to observe the market's behavior and apply rules that can construct a system for trading. We analyzed the S&P 500 E-mini contract for this case study. We did this because the E-mini has high volume, tight spreads and consistent price movement. This way we would have an increased likelihood of a repeatable pattern in the contract. I hope that was clear as mud. Take a look at the below table of the observations. Let's unpack the data in this table further. When trading this strategy remember to account for slippage as you will not get the highs and lows for entry/exit. I think the point of the study is to illustrate as the S&P pulls away from the VWAP, at some point it has a sharp correction back to the indicator. 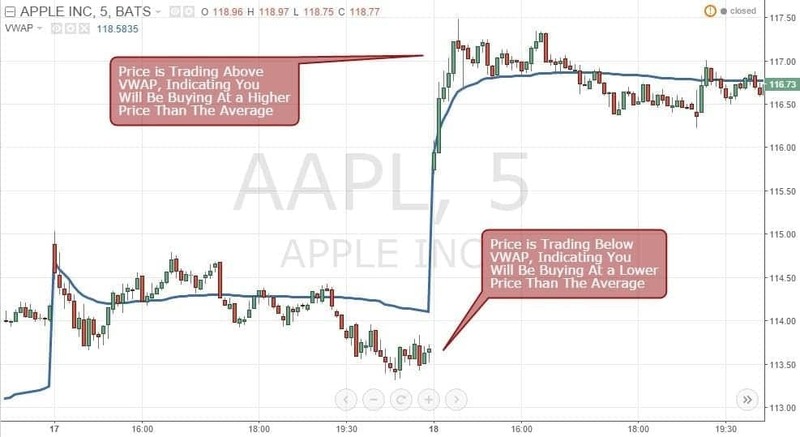 Once you apply the VWAP to your day trading, you will soon realize that it is like any other indicator. There are some stocks and markets where it will nail entries just right and others it will appear worthless. If you use the VWAP indicator in combination with price action or any other technical trading strategy, it can simplify your decision-making process to a certain extent. For example, when trading large quantities of shares, using the VWAP can ensure you are paying a fair price. Just remember, the VWAP will not cook your dinner and walk your dog. You need to make sound trade decisions on what the market is showing you at a particular point in time. If you have questions about the VWAP or want to discuss your experiences, please share in the comments section below. Dear Sir, I had bought DRREDDY in Futures and suddenly it started falling. Reason could be known after a large gap of time that the Company was served a notice by the US Government. Till then I had lost a lot of money and I am a retailer. How to avoid the same. Regards. Where do you get this VWAP indicator to try? Thanks. This is probably a valuable indicator because no one has it. Schwab doesn’t have it and neither think or swim. Where do I get this indicator? VWAP is a study in Think or Swim. Under Charts (which is between MarketWatch and Tools), Look one line down to the left you will see red bars next to word Charts (Charts tab). Click on Edit Studies (looks like a 1/2 filled bottle). Look left and make sure you are on the Studies tab and either click and search for VWAP or scroll all the way down, the studies are listed alphabetically. I do not use Prophet under Charts tabs, I only use Charts. Hope that helps. By the way, Great article Alton Hill ! Thanks. 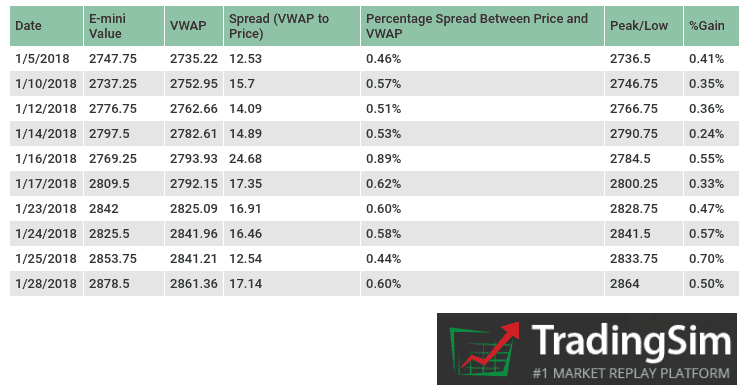 I will be using VWAP today in about 7 hours 🙂 Because of your article, I realize that I most likely have been paying too much for my positions. but never again. I randomly picked a stock to backtest VWAP and in the majority of instances when price broke above, for example, VWAP and VWAP began to trend up, the move was quite strong and VWAP acted as support time and time again. I was amazed. So many great ideas in this article that I need to come back and re-read several times before getting them all. This article will help me tremendously!